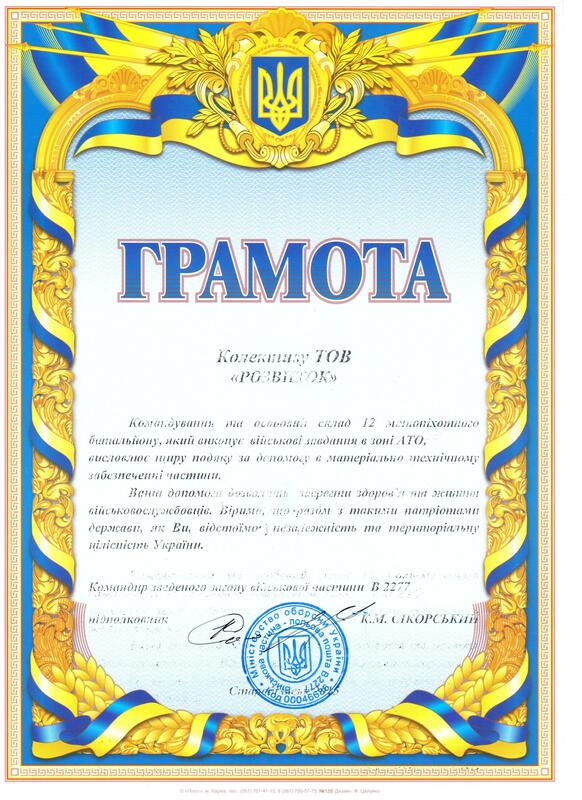 The leadership and personnel of the Military Institute of Telecommunications and Informatization expressed their sincere thanks for helping to improve the material and technical base of the Department of Automated Management Systems to the Commercial Director Oleg Bobovnik and Director Hanna Ostapyuk. 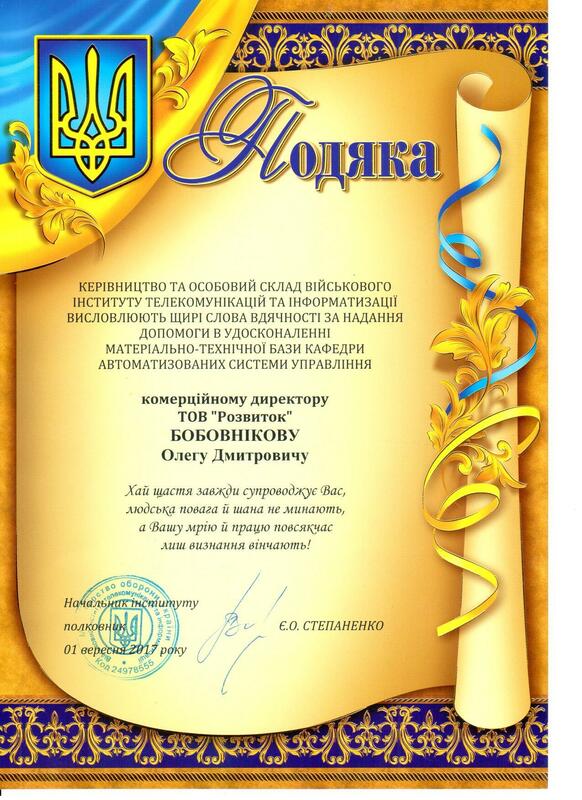 For fruitful cooperation, material and technical support of the University and on the occasion of the 60th anniversary of the Information and Computing Center, the Kyiv National Taras Shevchenko University announced its thanks to Oleg Bobovnikov and Rozvytok LLC team. 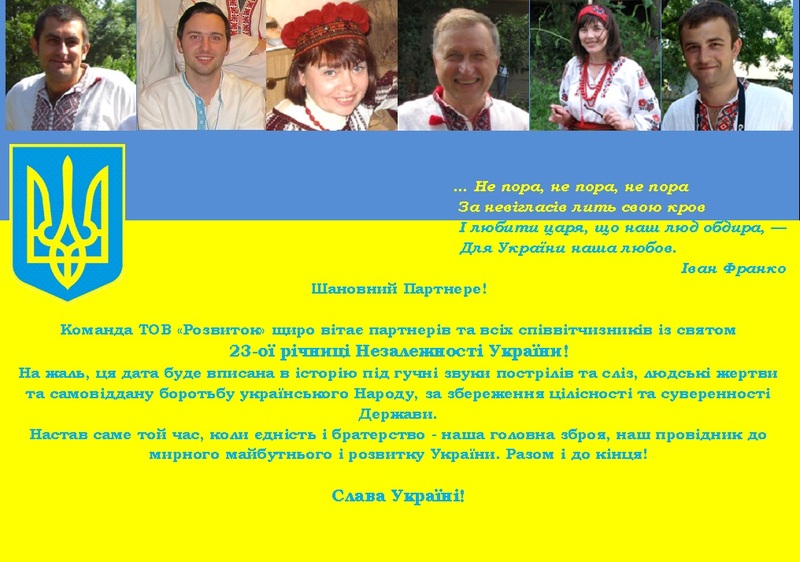 Rozvytok LLC Team congratulates all partners and compatriots with 23rd anniversary of Independence of Ukraine! 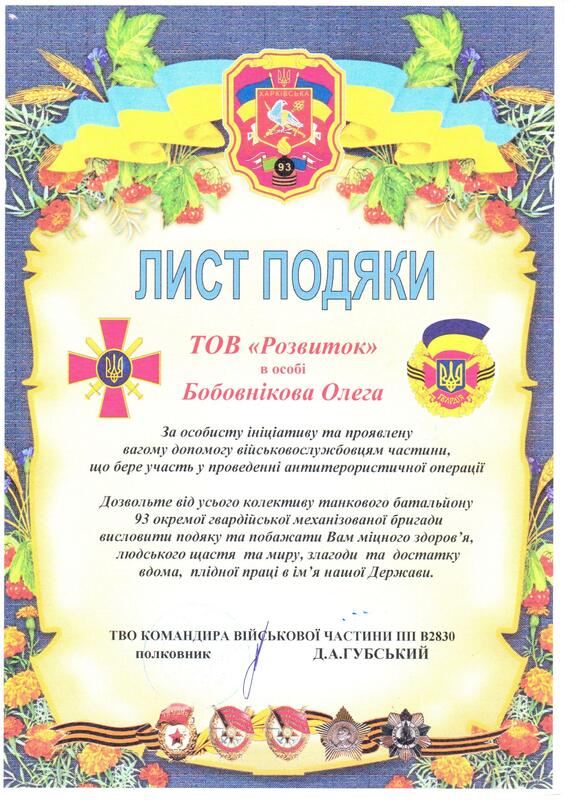 Rozvytok's Commercial Director Oleh Bobovnikov received letter of thanks from the 1st deputy Commander of Communication Troops of the Ukrainian Army, colonel Rapko. 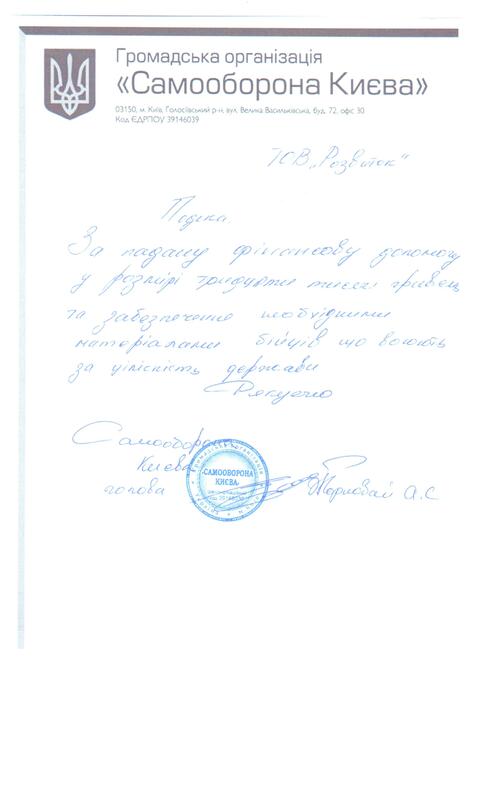 Letter is about Oleh's active public position and logistical support provided to soldiers of the Ukrainian army. 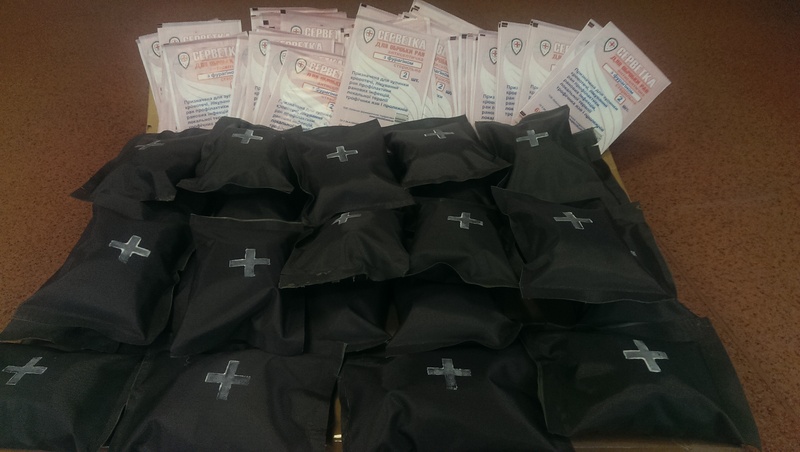 Rozvytok sends medical kits for the Ukrainian soldiers who are fighting at the front line with Russian aggressors. 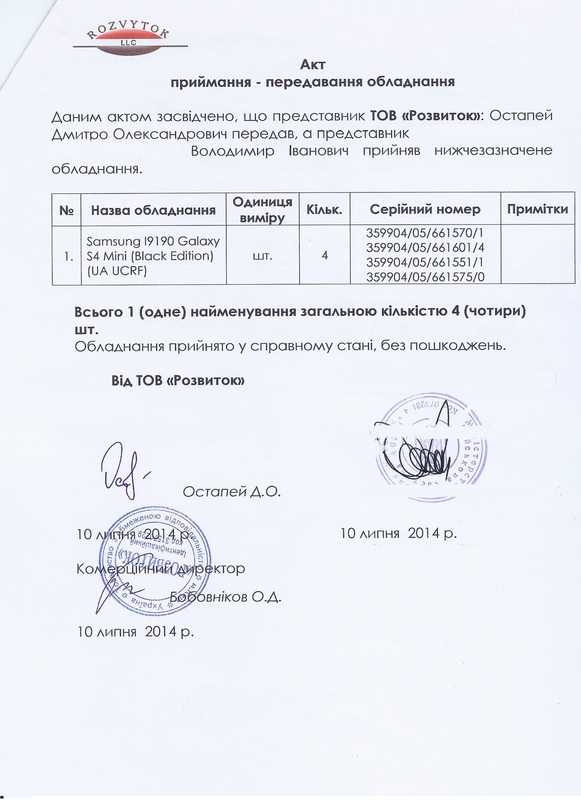 Rozvytok’s material assistance (4 mobile phones Samsung I9190 Galaxy S4 Mini), for the military unit. 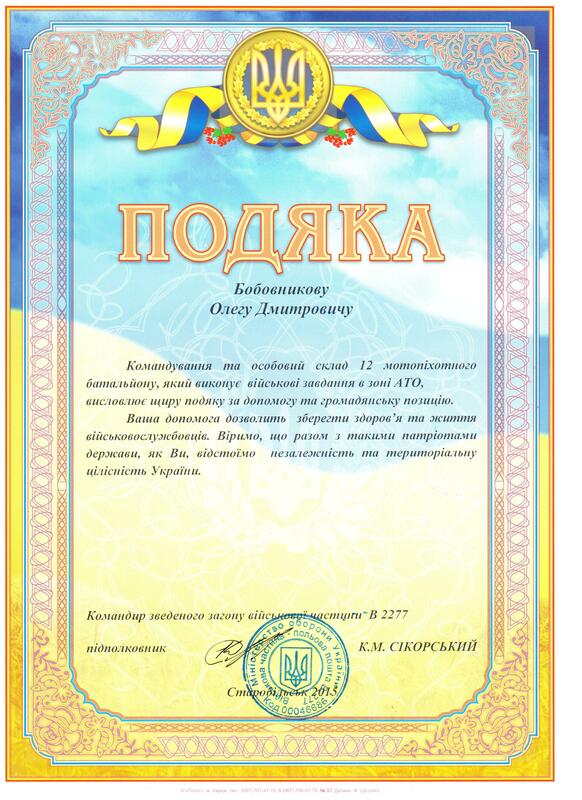 Rozvytok actively expressing their social position and financially helps in ensuring the necessary materials for fighters who are fighting for the integrity and the unitarty of the independent Ukraine in the war with fascist Russia. To view more photos click here. 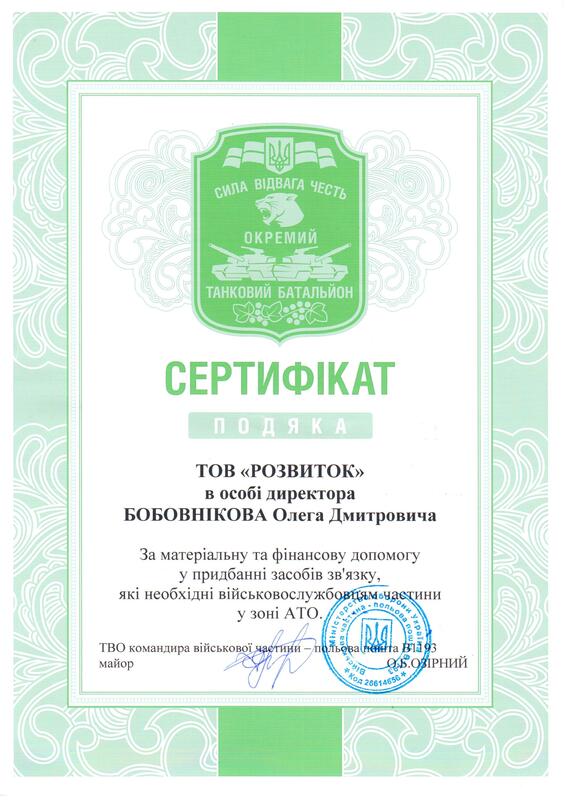 Letter of thanks from civil organization "Kyiv Self-defense" for financing purchases of body armor and army vests for the military in the area of ​​ATO. 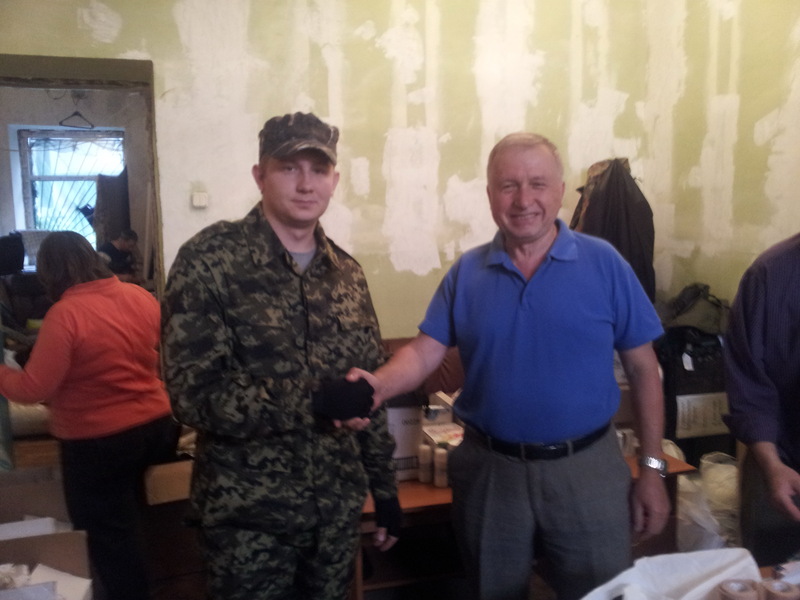 Thanks from the volunteer organization for the army vests purchase to Battalion "Aydar" and the 12th battalion of the territorial defense "Kyiv". 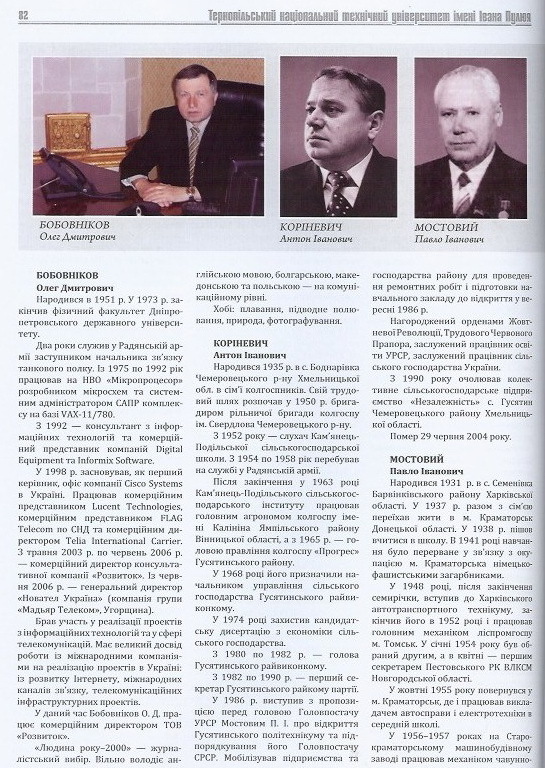 Rozvytok took an active part in the struggle of the Ukrainian people against the regime of Yanukovych and advocated for European integration of Ukraine. 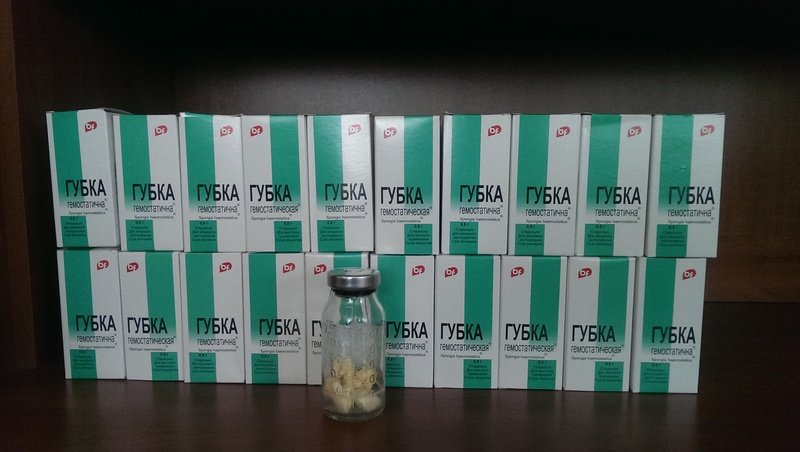 For the purposes of the tent city that was the stronghold of Evromaydan, for people who were not sparing neither themselves nor theirs health in the winter time, Rozvytok has provided weekly assistance in the form of warm clothing, shoes, medical supplies, telecommunications equipment, and many other necessities. To view more photos click here. 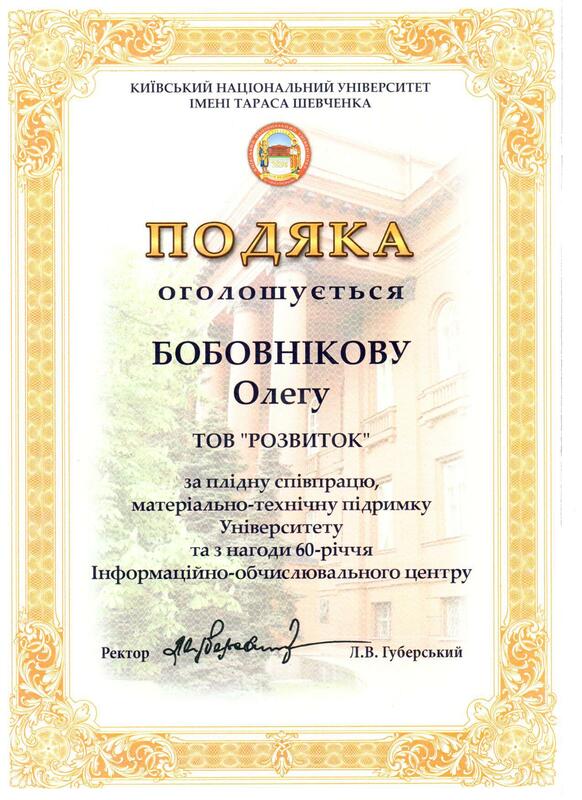 Rozvytok LLC was the founder of Halyny Novozhenets edition Painting. 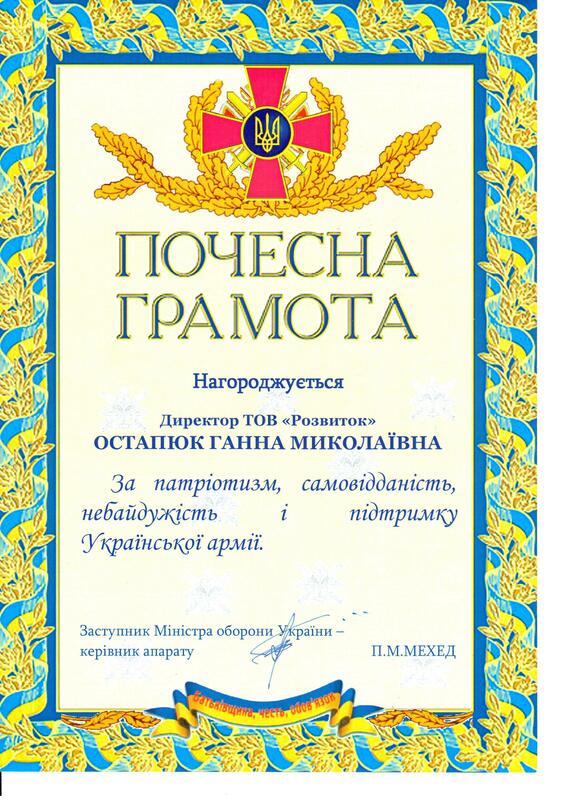 Publisher: BaK company, Lviv, 2013. 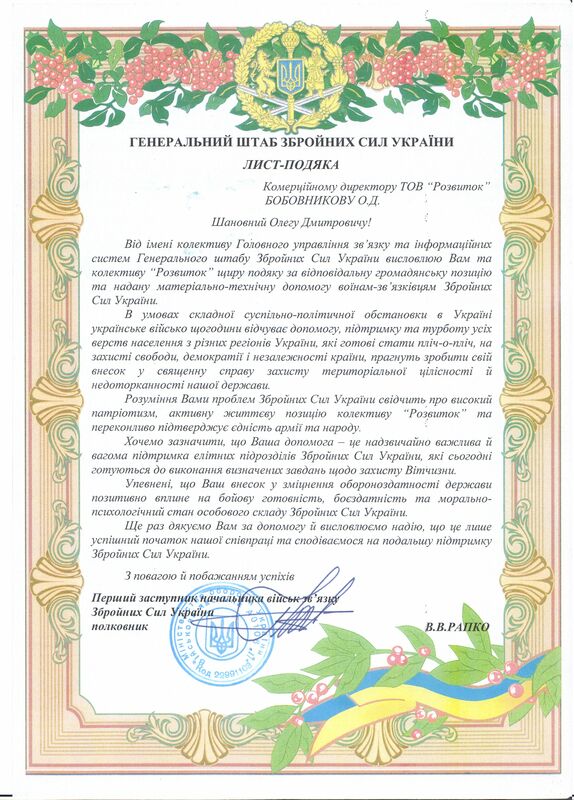 "With my personal vision of colour and design in painting I put a stake in the ground to mark the geographical place where I live paint..."
Rozvytok LLC was the founder of Ivan Shavel edition Curative Plants of Ukraine. 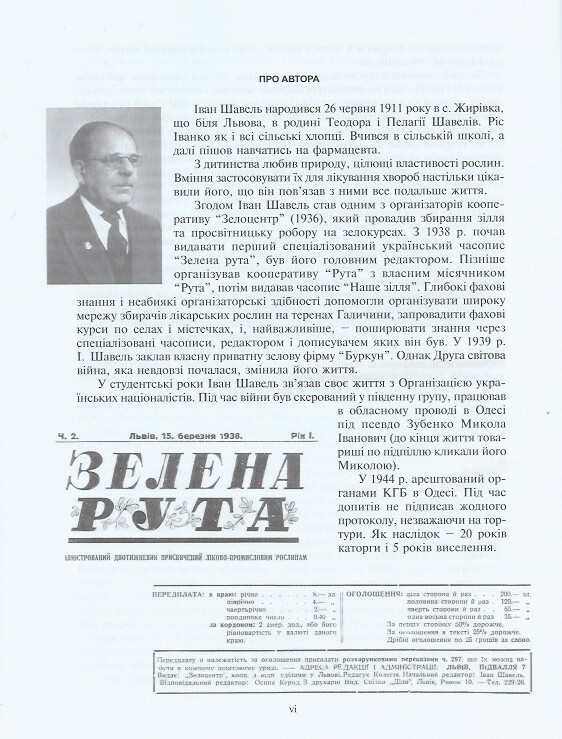 Publisher: BaK company, Lviv. 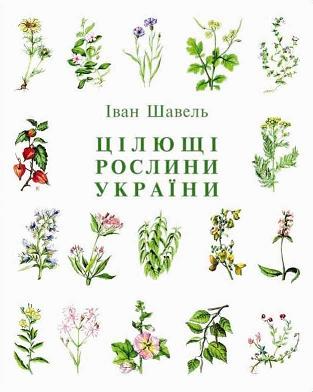 The book Curative Plants of Ukraine for anyone interested in folk medicine.In this unique book are describe 872 plants of Ukraine, which have healing properties - the regional people's names, composition, principles of collection and storage, have been systematized and described. The book includes recipes and methods of traditional medicine treatment of various ailments. The terminology, some terms, especially medical, which today are little-known or even forgotten have been maintained in this publication. The book is interesting for a wide range of readers.This book is an example of tireless service to the people and a great love for mother nature and language. 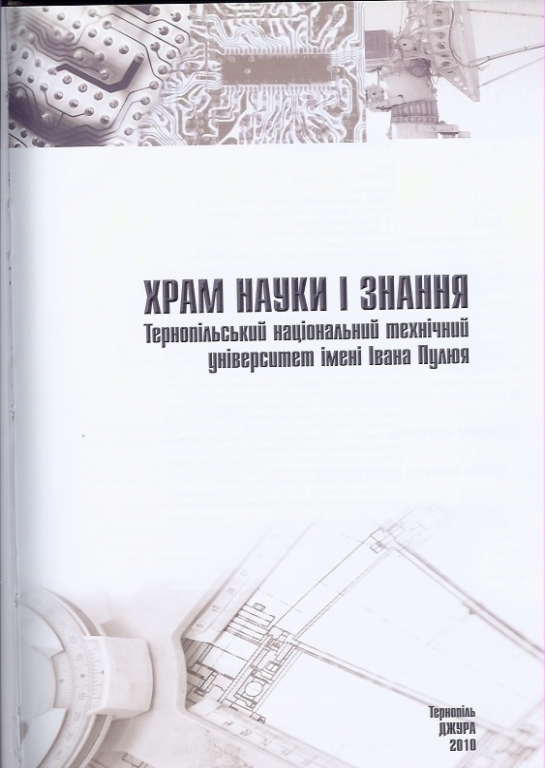 On the occasion of 50-th anniversary of the foundation of the Ternolpil Ivan Pul’uj National Technical University and 165 years from the birthday of Ivan Pul’uj, Rozvytok sponsored publication of the University Book "Temple of Science and Knowledge". - Ternolpil National Technical University is one of the 20 best universities among 200 higher educational institutions of Ukraine of the IV accreditation level (www.tstu.edu.ua). - Ivan Pul’uj - famous Ukrainian physicist and electrical engineer, great scientist, an outstanding cultural and political figure (www.tstu.edu.ua/?l=en&p=university/puluj).